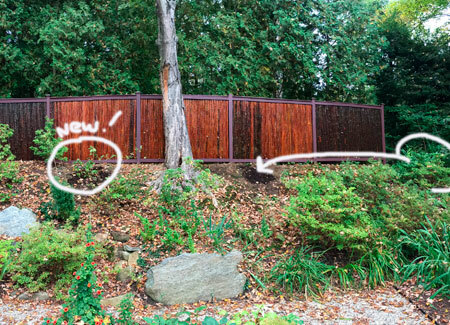 Never-ending Fall Clean Up- What’s a Gardener to Do? New England is a classic draw in the fall. People travel from far and wide to get the color experience. Gardeners rake forever, and clean gutters in between -especially if you’re fortunate enough to have maple trees overhanging the entire front of your home and garden. And dear Larry to get up on the ladder with a garden hose. Fall plant care..can’t live with it, can’t live without it. Whoa! Where did these little guys come from? Such unassuming, barely green stragglers today, that come next spring you’ll be paying soo much more for! Over the last five years, many of the perennials near the road have been facing decline between lack of rainfall and road salt. This year an anticipated garage repair is stepping up plant relocations from the street into other gardens where I can keep an eye on them. In Fall, while doing annual maintenance cutting back dead perennials, I’m forever on the lookout for new color and texture. Gardeners everywhere know that come summer’s end, Mother Nature and nurseries collude to make it extremely difficult for those of us who suffer from plant addiction. At least this year, I’ve embraced that truth. Maybe next year I can begin the first step in treatment. Not leaving the property. (?!!!) I don’t think so. Look no further for a petite, colorful evergreen. It’s perfect when you lust after changeable colors starting with bright gold in Spring maturing into fire engine colors in fall. The Fire Chief holds its compact shape without any pruning! At 30% off at a nursery near me, how could I NOT buy it? Speaking of evolving colors. Look what I found yesterday. We’ve all heard volumes about Monarch butterflies so I was pretty sure it was a Monarch when I saw it. 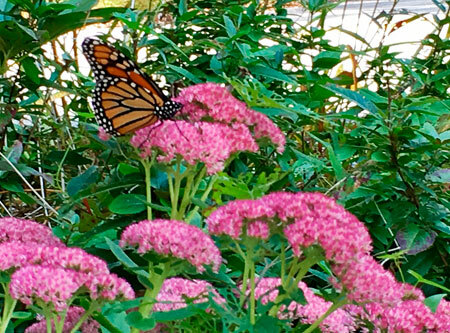 Apparently our visitor was sitting on an autumn flower known to attract them- a sedum plant. 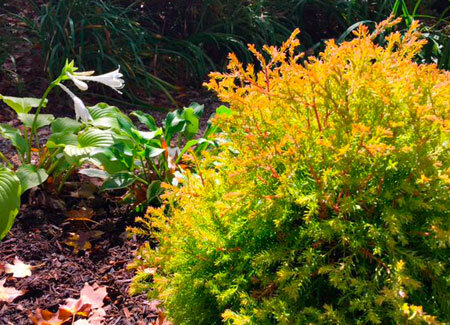 Another great plant that changes its color thru the seasons. Stonecrop Sedum have longstanding blooms, from August to November, that change color as they bloom from deep pink to rust. Put them in a sunny spot- even near the road, as they rarely require watering. More about monarchs from US Fish and Wildlife. The newly re-located white hydrangea. The arrow marks the new hole with magnolia bush to its right, waiting for Spring transplant. Who plants on hills like these??? Who knew. 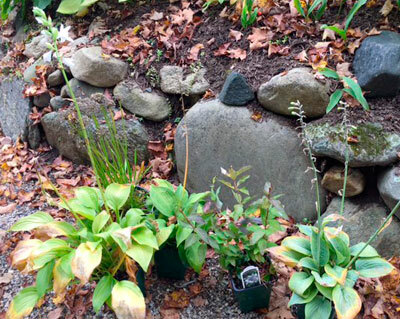 I had just moved a small white hydrangea from the road, planning to also transplant a magnolia later in the day. I’d been eyeing the progress of the small magnolia bush I’d planted four years ago. Crowded between a fir tree and a couple expanding azaleas you could tell there wasn’t enough room to grow. Little did I know… magnolias are known to reach out and choke their neighbors. They grow an ever expanding carpet of shallow roots that can become a problem. (Don’t ever plant them close to the house or other ornamentals). I decided to move the three foot high magnolia before it got any bigger. I dug as big a hole as possible but…not so fast.. Apparently if you’re transplanting a magnolia bush it’s better to give it a” root pruning” the season ahead of transplanting. Gee, too bad I can’t finish digging two monster holes right now.. Flailing away at a rocky, rootbound hill for hours yesterday and NOT tumbling down the hill countless times, yeah, I’m waiting for Spring 2018. Complete instructions here. 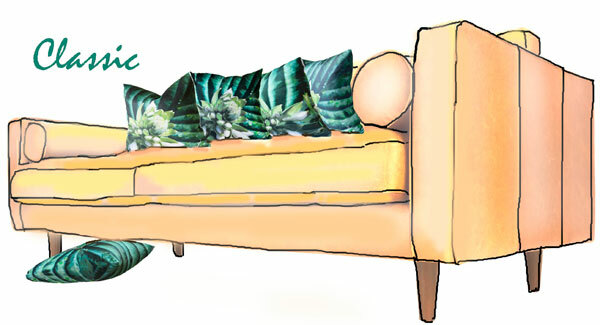 If you know Paola Pillows you know I’m a HUGE hosta fan. 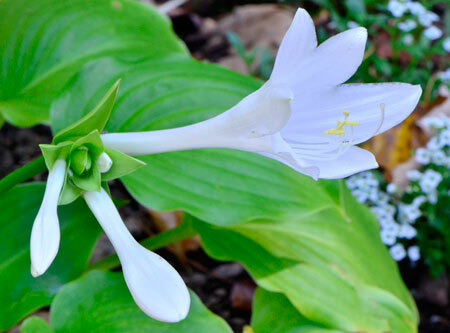 Last fall I planted my first fragrant ones, called H. Plantaginea, which have the largest known hosta flower and yes, boast a scent that’s just divine. They’re finally blooming! This hosta has white flowers as big as 6″ across. And late bloomers are always appreciated in a rusty, leaf-covered landscape this time of year. Agree? Chuck Edward Anderson Barry who died in March of this year, is considered a pioneer of American Rock and Roll. Born to a middle class family in St. Louis, Missouri in 1926, Chuck Berry quickly got into trouble with the law as a teenager and after an armed robbery conviction was sent to reform school for three years. He later got married and took a job at an automobile assembly plant. In 1953, he began a career in music that spanned his entire lifetime and gained him international fame as a writer, singer and performer. 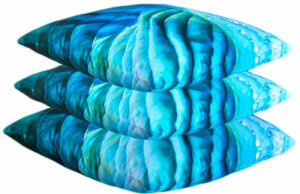 The great things about Paola pillows is that like flowers, they never go out of style. Just be sure to have plenty of them for different times of year. You can remove, wash and change the covers in season.